We here in Rogue River Country understand how much effort you and your put into planning your Oregon family reunion. We understand, because we make that very same effort for every group that chooses Rogue River Country as its family reunion destination. Rogue River Country has many family reunion options as well as a fun and exhilarating list of activities, family reunion attendees can participate in. We at Rogue River Country find that family reunions with planned activities have greater attendance. We think you will find this true also. located on Interstate 5 just 30 miles north of the California boarder. Numerous Family Reunion Facilities for up to 700 people. We will tailor a proposal for your needs. Family Reunions lodging rates will come in below other areas with the benefit of less traffic, more activities for family reunions attendees and a local airport with direct flights to Portland, San Francisco, New York City. Area Family Reunion activities include Rogue River Salmon & Steelhead Fishing, Fly Fishing, Whitewater Rafting, Snow Sports, Crater Lake National Park (80 miles), Great Golf, Bowling, ATV Rentals, shopping and Winery Tours. Camping is available on the Rogue River or area lakes. A great location for a Oregon Family Reunions. Located on Interstate 5 about 55 miles north of the California boarder. A great location for Family Reunions for groups to 300 attendees. Great parks and the Rogue River runs through town. Attendees will have trilling Whitewater rafting opportunities and Whitewater Jetboat Trips with Hellgate Excursions. Salmon and Steelhead fishing is supplied by the Rogue River with its huge runs of fish. Medford Airport services Grants Pass also only 25 miles away. Indian Mary Park located down river of Grants Pass on the Rogue River is a favorite Family Reunion location for outdoor picnic and camping facilities. A great location for a Oregon Family Reunions. Located on Interstate 5 about 20 miles north of the California boarder, home to Oregon’s best live Theatre performances and Lithia Park great dining some with entertainment. Ashland is home to Southern Oregon State College, Ashland is truly the quaint college town with culture. Family Reunion Facilities for up to 250 people. A great location for a Oregon Family Reunions. Located 7 miles north of the California boarder on Highway 101 were the Chetco River meets the Pacific Ocean. Brookings Family Reunion facilities will handle 250 people. A small coastal retirement town just 45 minutes from the Crescent City airport. Family Reunion attendees will enjoy the uncrowded beaches, summer time swimming in the Chetco River, Ocean Charter fishing for Salmon and Bottom Fish. October thru March Salmon and Steelhead abound in the famous Chetco River a fisherman’s paradise as is the Rogue River 30 miles north at Gold Beach. Salmon Run Golf Course (18 hole) is one of the best courses on the Oregon Coast located here. Lots of Camping and fishing opportunities. A great location for a Oregon Coast Family Reunions. Located 37 miles north of the California boarder on Highway 101. Just 1 hour to Crescent City, Ca. airport and 1.5 hours to Coos Bay / North Bend Airport. Gold Beach is the County seat and boasts the County Fairgrounds as well as a number of private facilities for your Oregon Coast Family Reunion. Serving of meals is available from some of the finest caterers in Oregon. Gold Beach is where the famous Rogue River meets the Pacific Ocean. The Rogue Rivers Salmon and Steelhead runs are legend, Spring Chinook Salmon, Fall King Salmon, Silver Salmon, Summer and Winter Steelhead all these runs are the largest recorded runs in Oregon. Rich Ocean bottom fishing opportunities are found off the Rogue River Reef. Beaches and Tide Pools with secluded Oregon Coast Old Growth Timbered hiking trails. Upriver Whitewater Tour Boat Rides are provided May to October by Jerry’s Rogue Jets. Local 9 hole Golf Course and 4 top ranked 18 hole Golf Courses within a 1 hour drive. Great camping and fishing opportunities. A great location for a Oregon Coast Family Reunions. Located 54 miles north of Gold Beach Oregon on Highway 101 at the mouth of the Coquille River where the Coquille meets the Pacific Ocean. Bandon Oregon Coast Family Reunion facilities will handle up to 200 people. Reunion attendees will experience great Ocean Charter fishing for Bottom Fish, Salmon, Halibut and Tuna. Bandon is the best place to crab for Dungeness Crab on the Oregon Coast. Crab from the port docks with shops renting equipment and bait and even cleaning and cooking your catch afterward. Bandon boasts of two of the nations top three Golf Courses in Pacific Dunes ranked #2 by Golf Digest and Bandon Dunes #3 by Golf Digest. Salmon fishing in the Coquille River is very good Late August to mid October. Great shopping in Bandon’s Old Town section. A great location for a Oregon Coast Family Reunions. Located 27 miles north of Bandon on Highway 101. Coos Bay / North Bend offer Family Reunion and Event facilities for about 400 reunion attendees. Clamming , Oysters, Crabbing, Ocean Charters, scenic beaches and parks are hallmarks of Oregon’s second largest sea port. 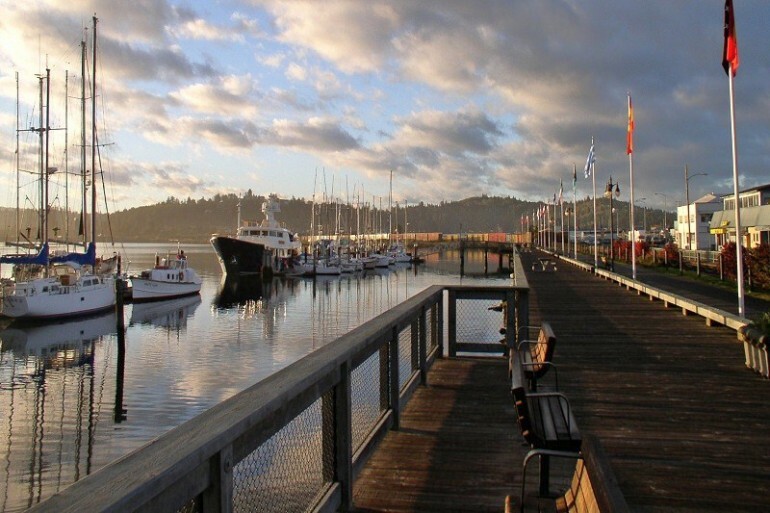 Known as the Bay Area, Coos Bay – North Bend has the best regional shopping and gift shops. One of the tourism hot spots in the Bay area is the Old Mill Casino & Hotel located on beautiful Coos Bay in North Bend, Oregon. The Bay Area is also the gateway to the Oregon Dunes National Recreation Area which include some of Southern Oregon’s finest Large Mouth Bass fisheries in local lakes such as 10 Mile Lake at Lakeside, Oregon just North of North Bend. It is hard to imagine better clamming anywhere in Oregon than is found a Charleston Harbor here in the Bay Area, local shops will rent gear and point you in the right direction for a seafood gathering excursion. A great location for a Oregon Coast Family Reunions. Located on Interstate 5 about 100 miles from the California line and 70 mile south of Eugene Oregon. Family Reunion and Event facilities in Roseburg will accommodate 300 reunion attendees. Good choices for dinning and lodging are available. Highway 138 runs East from Roseburg following the tremendously beautiful North Umpqua River. The North Umpqua is a Mecca for Summer Steelhead Fly Fishing. Highway 138 leads to the North entrance to Crater Lake National Park, one of the Seven Wonders of the World. The North Umpqua is also noted for its Whitewater Rafting opportunities. Small Mouth Bass and Shad fishing are to be found in abundance in the Main-Stem Umpqua west of Roseburg. Great camping and fishing opportunities. A great location for a Oregon Family Reunions. From your first contact with Rogue River Country Oregon Family Reunion staff, we begin to put together a detailed list of your group’s needs and desires. With that information, we will assemble a tailor-made Family Reunion proposal, complete with rates and availability for facilities and locations that can accommodate your Family Reunion.